There’s poetry in the way the Tuscan estate of Caiarossa describes its vineyard land – the land of nature and silence. Set amongst Mediterranean brush, ancient olive groves and with distant views to the Tyrrhenian Sea, this organic and biodynamic-certified estate has even constructed its cellars following the ‘positive energy’ principles of Feng Shui. 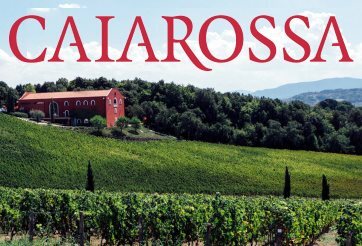 The Caiarossa name combines the Greek Godess Gaia, goddess of fertility and nature, and the rossa – red – soils of the estate, where iron-infused jasper (a quartz rock) gives an intense red colour. Today the estate is owned by the Jelgersma family, also owners of Bordeaux châteaux Giscours and du Tetre in Margaux, and although local hero Sangiovese dominates in some cuvées, the estate is mostly planted to Bordeaux, Rhône and other French varieties. Its more coastal situation, just north of Bolgheri, has a maritime climate that suits Bordeaux varieties, especially given that the vineyards are at a higher altitude, around 30 hectares planted among the olives and holm oaks of the 70-hectare estate at between 150 and 250 metres. It’s a quality-focused estate, with hand-harvesting and hand-sorting of grapes, and although minimum copper and sulpher (the traditional ‘Bordeaux mixture’) is used in the vineyards to ward-off fungal diseases, treatments are strictly organic and biodynamic of course. All fermentation is by indigenous yeasts, in large oak vats and small concrete tanks, and oak appears to be used sensitively, with a range of barrel sizes used for maturing the wines, usually involving only a small proportion of new oak, before considerable time in concrete tanks before blending and bottling. 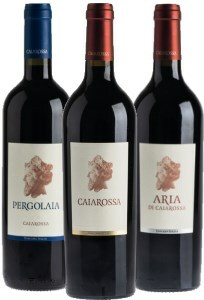 I have tasted the wines of Caiarossa a few times over the years, and they never fail to impress. These are wines with an absolutely classic European character, but a carefully-nurtured, expressive and deep fruit character too, giving them a quite sumptuous feel. There are six wines in the Caiarossa portfolio, including a white wine made principally from Viognier and Chardonnay, a sweet wine made from Petit Manseng, and Essenzia, released in magnum only, from an ever-changing blend of grapes, when the Caiarossa team thinks there is something special about the vintage that they wish to express. For this article I tasted the other three wines in the range, including the flagship Caiarossa, Aria di Caiarossa made from some of the estates younger vines, and Pergolaia, the ‘modern interpretation of Tuscan tradition’, composed mostly of Sangiovese. UK retailers include Berry Bros. & Rudd and Farr Vintners, but please use the wine-searcher links below for current retailers. (2018) Mainly Sangiovese with small amounts of Cabernet Franc, Cabernet Sauvignon and Merlot, this is fermented with indigenous yeasts in concrete tanks, before spending around two years in a mix of old 500-litre barrels and concrete. What a lovely nose, bloody and gamy, and yet suffused with ripe summer berries, elegant tobacco spice adds another layer. In the mouth this is really juicy, the black and red fruits combining to give both some lusciousness and freshness, more of that gamy character and cherry-pit acidity into the spicy, long finish. Wine-searcher shows no UK stockists for this particular vintage at time of review, though 2013 is available. (2018) This is a blend from younger vines, led by Cabernet Franc and Merlot along with Cabernet Sauvignon and some Syrah too, fermented in large oak casks with indigenous yeasts and aged in barriques and French tonneaux for about 14 months, with15% of new wood. I really enjoyed this hugely authentic and expressive wine, very reminiscent of right bank Bordeaux, with a wild gamy, balsamic and stewed plum character, lovely graphite and cedar notes, and a sense of lush generosity. In the mouth it is sweet-fruited, but that gaminess and slightly wild edge adds loads of savoury interest, the sweet tannins and good, sour cherry acid structure freshening and lengthening the finish. (2018) A blend of four Bordeaux varieties (77%), Syrah (11%), Sangiovese (8%) and Alicante Bouschet (4%). Coming from the older vineyards, each plot is vinified separately and aged in oak for betwen 11 and 20 months, depending on the characteristics of the plot and variety. The blend is made once each component has completed its ageing. There's a lovely, saturated depth of colour here, and though touched by graphite and cedar, a very much more pure, solid and supple black fruit quality than the Aria, though little floral hints add plenty of intrigue. It flows through to the palate with a full and creamy, truly silky weight of blackcurrant and chocolate, but the precision and bite of the bittersweet cherry-skin acidity and very refined tannins are gorgeous against the fleshy density of the wine. Absolutely ready to drink, but should hold for many years too.